'Tis The Season To Be Crazie! 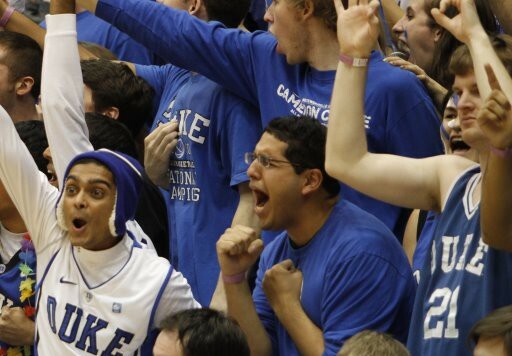 The deluge of final exams and papers has finally subsided and Duke’s students have returned home for the holidays, but as we know Duke basketball never stops and neither do we! Although the winter break comes with a bit of a lull in our Blue Devils’ schedule, there will be no similar lull in our content. In fact, as a holiday gift to our readers, we’re stepping up our game and have scheduled to bring you new content every single day from now until Duke’s ACC opener against Georgia Tech on January 7th, because there’s no better way to ring in the holidays than with Duke basketball. For the next three weeks we’ll continue to bring you previews, recaps, and advanced metric analyses of the few games Duke will play over the break against UNC-Greensboro, Western Michigan, Penn, and Temple, but the fun doesn’t stop there. We also have some really cool features to roll out on days the Devils don’t play, including a comprehensive team-by-team ACC preview that will take us right up to the conference schedule. Be sure to check in each and every day as we approach and celebrate the most exciting part of the regular season. Once again, happy holidays from us, and most importantly, stay Crazie, my friends. Looking forward to keeping up with Duke through your site. We can never have to much news where Duke is concerned.